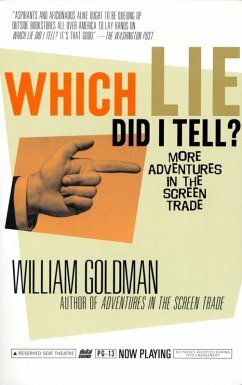 From the Oscar-winning screenwriter of All the President's Men , The Princess Bride , and Butch Cassidy and the Sundance Kid , here is essential reading for both the aspiring screenwriter and anyone who loves going to the movies. From the Oscar-winning screenwriter of All the President's Men, The Princess Bride, and Butch Cassidy and the Sundance Kid, here is essential reading for both the aspiring screenwriter and anyone who loves going to the movies. If you want to know why a no-name like Kathy Bates was cast in Misery, it's in here. Or why Linda Hunt's brilliant work in Maverick didn't make the final cut, William Goldman gives you the straight truth. Why Clint Eastwood loves working with Gene Hackman and how MTV has changed movies for the worse,William Goldman, one of the most successful screenwriters in Hollywood today, tells all he knows. Devastatingly eye-opening and endlessly entertaining, Which Lie Did I Tell? is indispensable reading for anyone even slightly intrigued by the process of how a movie gets made. 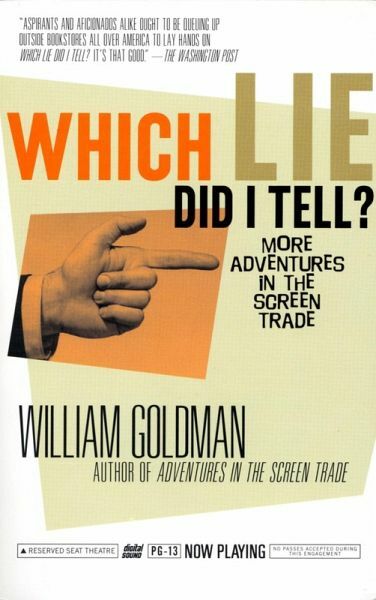 William Goldman was an Academy Award-winning author of screenplays, plays, memoirs, and novels. His first novel, The Temple of Gold (1957), was followed by the script for the Broadway army comedy Blood, Sweat and Stanley Poole (1961). He went on to write the screenplays for many acclaimed films, including Butch Cassidy and the Sundance Kid (1969) and All the President's Men (1976), for which he won two Academy Awards. He adapted his own novels for the hit movies Marathon Man (1976) and The Princess Bride(1987).